Rimac Concept Two: An Electric Hypercar In The Making..! Rimac Automobili is a Croatian manufacturer of electric supercars. The company recently unveiled the Rimac C Two electric hypercar. This car is the next model in the pipeline with lots of performance upgrades and improvements. The Rimac concept one is the first model in the segment and Rimac Concept Two is next one. 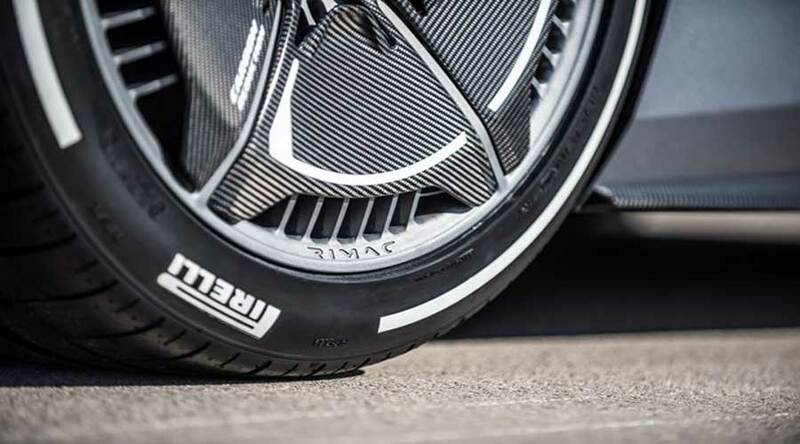 Rimac is very keen in designing products. Everything that is designed, has some purpose in it. The purpose may be active or passive. The elegant styling with timeless design makes this car a class apart. The butterfly doors make the entry into the car a dramatic experience. The wide opening doors always make entry seamless, effortless and comfortable. The sculptured rear view along with the width of 1.986mm marks the car's presence anywhere. We can clearly say that it’s not an ordinary presence but an extraordinary one. Forged alloy wheels are lightweight and aerodynamic. Now, what you can say? The wheels, themselves are aerodynamic. Such a minute thinking makes this car appealing and unique. Furthermore, the aerodynamic wheels channel the air to the carbon ceramic brakes. Thus, this ensures optimum temperatures and avoids overheating. The tires have a bespoke design. They have specially designed compound in collaboration with Pirelli. The high intensity LED Headlights are made up of 58 LEDs. The handmade squadron of LEDs is integrated into Rimac control unit. It illuminates the roads clearly. Both the Headlights and tail-lights have a ventilation system. These air outlets keep the headlights under normal working temperature. Firstly, Rimac changed the concept of Aerodynamics. The Rimac C Two has active aerodynamics which helps the car to change the aerodynamic profile. The change in aerodynamics helps the car to reduce the aerodynamic drag coefficient. As a result, the car simply cuts the air smoothly without losing performance and efficiency. The bonnet of the car has active flaps. Active flaps change the aerodynamic profile effectively. The low-drag mode makes the car more aerodynamic with the help of front splitter. Front splitter helps in lowering the temperature of batteries and electronics. The most noteworthy future of the car is Aero Air Brake. The Aero Air Brake is fully integrated into the rear of the car. The aero-wing adapts to the various positions in accordance with a load in the car. As a result, Aero Air Brake increases cornering downforce and maximizes the top speed. On extreme breaking, it will act as a full Air Brake and helps to stabilize the vehicle. In addition, the fully flat floor with optimized venture effect removes positive pressure from the bottom. Active rear flaps alter the effect and optimize the air flowing from beneath. The flaps also help to reduce the temperature of batteries stored underneath. 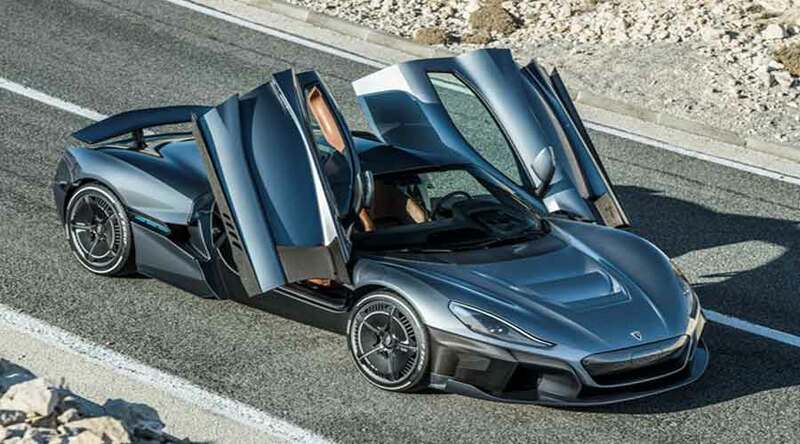 The Rimac C Two has a full carbon fiber body. Thus, it makes the car strong, durable and lightweight. The integrated battery pack along with bonded carbon roof adds more to its structural advantages. In addition, the crash structures are made up of aluminum and carbon fiber giving more strength. The C two features liquid-cooled battery pack holding 120kWh. This massive battery produces the massive power of 1.4MW. The battery pack is optimized for best possible power to weight ratio as well as passes stringent safety standards. The four electric motors attached to each wheel gives immense dynamic control. The oil-cooled motors give an instant response with 97% efficiency. The motors are maintenance-free. They are able to achieve maximum torque from zero rpm. The single-speed gearbox is attached to each front wheel while double speed gearbox is attached to each rear wheel. This kind of arrangement helps to distribute massive power efficiently. No wonder, this car has mind-blowing acceleration. It goes 0-60mph in just 1.85seconds. Rimac C Two has a top speed of 412 km/h. 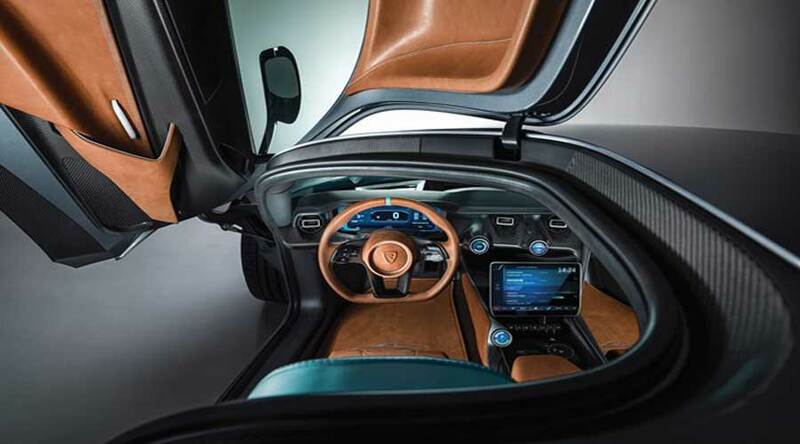 The C Two electric hypercar features a virtual driving coach. The ‘Driving Coach’ function helps to learn racing in real-time. The car can load selected race tracks on the onboard systems and help you race. The system also helps in acceleration points, braking points and guidance on racing lines. The electric motor for each wheel enables torque vectoring. As a result, you no longer need to reduce your speed at corners. The R-AWTV system replaces traditional ESP and TCS. While it enables minute infinite control on the torque applied to each wheel. Hence, you get a precise and dynamic control on every wheel. Furthermore, the car also features the facial recognition. Rimac C Two electric hypercar is far ahead of its competitors. So, you don't need keys or smartphones to unlock the car. It just requires your face. The 500 telemetry channels help to integrate everything in mobile app or laptop. Hence, you can analyze everything in real time. Besides, the unique ADAS AI-based functions help you to keep your car safe. The collision prevention and blind spot monitoring systems keep you safe. The lane keeping function including traffic pilot functionality makes your travel stress free. The ADAS system also recognizes prevalent weather conditions and adapts accordingly. However, the system is agile and sensitive at the same time. This is possible due to eight onboard cameras, six radar emitters, and twelve ultrasonic sensors. The car also has IMU sensor and precise GPS technology for autonomous driving. Furthermore, the six screens on dashboard help you navigate select or play. The co-driver's display shows the relevant information on the go. The billet aluminum rotary switches are gorgeous and functional at the same time. As a result, the owner can simply control everything via those controls. This includes starting/stopping of the vehicle and torque management. In addition, only relevant information is displayed as per drivers need; so displays remain clutter free and intuitive all the time. The car has the seating capacity of two including the luggage. The car also has a range of 650 km. The fully electric sports seats are able to accommodate almost anyone with the helmet. So, it really doesn’t matter whether you are touring or on a race track. The rear trunk is customizable according to the owner's need. This car is built to the perfection and detail. However, it doesn’t look aggressive or passive at all. Every part of the car is seamless and fits perfectly into each other. The on-site production helps Rimac build cars according to exact customer expectations. From metals & carbon fiber to the electronics everything is produced under one roof. Additionally, Rimac even produces the tooling of every individual piece on site. Thus, all this helps in building a quality product in the end. In conclusion, Rimac C Two is the piece of art and engineering at the same time. The breathtaking design and performance is a creation of passion and nothing else. 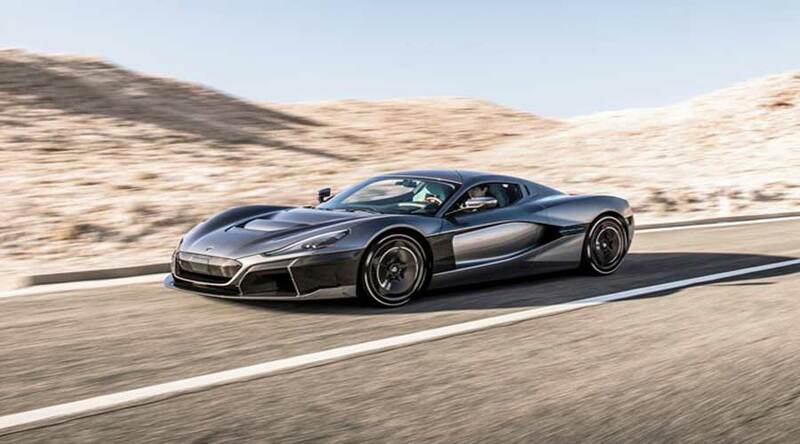 Home » Articles » Rimac C Two Electric Hypercar: A Serious Threat To Tesla? Apple car: Reality or just a myth…..?